The Amy Gillett Foundation congratulates the Tasmanian Government on its significant and purposeful step to improve bike rider safety by allowing drivers to legally cross continuous lines in order to safely overtake bike riders. As of 25 February 2015, motorists will be able to cross continuous white centre lines, both single and double, to allow a safe distance between their vehicle and a bike rider, when it is deemed safe to do so. Amy Gillett Foundation CEO Tracey Gaudry applauded the Tasmanian Government for its commitment to bike rider safety, saying the new road rules are a step in the right direction. 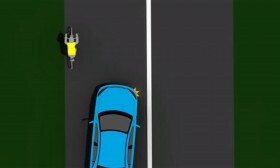 “The Tasmanian Government is empowering motorists to overtake bike riders in a safe and responsible manner by allowing them to legally cross the centre lines without risk of being penalised,” Gaudry said. Watch the Tasmanian Government’s ‘Crossing the centre line’ video below. The Government also outlined the safe overtaking distances for a motorist when passing a bike rider as one metre at speeds of up to 60 km/hr and 1.5 metres at speeds above 60 km/hr. It comes after the South Australian Government announced last month it would become the third Australian jurisdiction to introduce minimum overtaking distance legislation for motorists overtaking bike riders, following Queensland and the ACT. Read more about South Australia’s commitment to a metre matters here. “We know that minimum overtaking distance legislation is already having an extremely positive impact in Queensland. Survey results show a positive shift in driver behaviour and bike riders experiencing an increased feeling of safety on Queensland roads after just six months of the legislative trial,” Gaudry said. Find out more about the Queensland survey results here. Tasmania was the only Australian state or territory not to record a bike rider fatality in 2014, the same year it introduced the Foundation’s It’s a two-way street road safety education campaign into the state. The Amy Gillett Foundation urges Prime Minister Tony Abbott to continue riding his bike to help maintain a healthy and balanced lifestyle, and be a positive role model for Australians of all ages. The Prime Minister’s retired physician Doctor Graeme Killer recently raised concerns that Mr Abbott may be at risk while riding his bike on the road. As an avid rider, Mr Abbott has extensive experience riding on different roads and in varying conditions across the country during his daily exercise routine. He also enjoys the numerous benefits of riding a bike, such as maintaining health and fitness, and the enjoyment of interacting with people of all walks of life in the bike riding community. People in positions of influence, such as health professionals, politicians and transport leaders, can all contribute to safer bike riding in Australia by taking positive steps to improve bike education and skills, infrastructure and vehicle design, and raise greater awareness of how drivers and bike riders can share the road safely.